A new boy named Eugene has moved in next door to Zelda and Ivy. the three quickly become friends. A romance blooms, they play imaginary games, and go camping. Like all friends, they don't always get along, but they work out their differences. 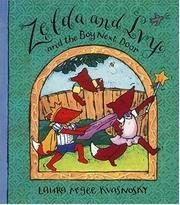 Kvasnosky, Laura McGee, “Zelda and ivy and the boy next door,” Children's Picture Book Database at Miami University, accessed April 25, 2019, https://dlp.lib.miamioh.edu/picturebook/items/show/9548.